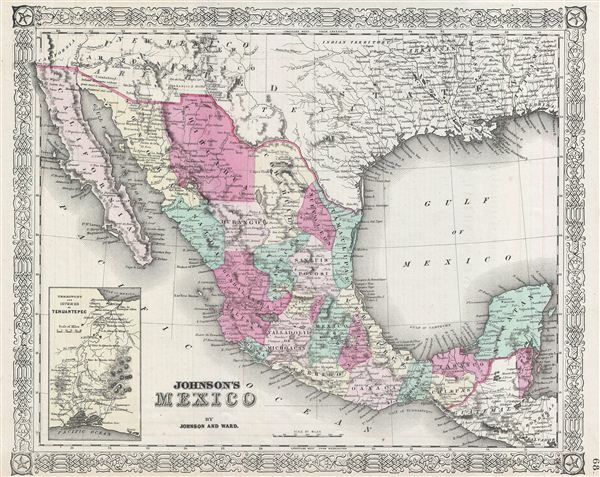 An excellent 1865 example of Johnson's map of Mexico and Texas. Like most of Johnson's maps, this map was derived from an earlier map by J. H. Colton issued in 1855. Covers all of modern day Mexico as well as most of Texas, Guatemala, Belize, and adjacent regions. Includes some interesting notations such here and there as 'Uninhabited,' and 'isolated maintains without grass wood or waters...' An inset map in the lower left corner details the Territory and Isthmus of Tehuantepec - the site of a proposed but never built Panama-like trans-continental canal. This map also identifies various cities, towns, forts, rivers, rapids, mountain passes, fords, and an assortment of additional topographical details. Map is hand colored in pink, green, yellow and blue pastels to define national and regional boundaries. Features the fretwork style border common to Johnson's atlas work from 1864 to 1869. Published by A. J. Johnson and Browning as plate number 68 in the 1865 edition of Johnson's New Illustrated Family Atlas. Johnson, A. J., Johnson's New Illustrated (Steel Plate) Family Atlas with Descriptions, Geographical, Statistical, and Historical, (Johnson & Ward, New York) 1865.